A naughty or nice 2019? They say if you keep making the same prediction, at some stage it will come true. Well, my 2018 post a year ago on the return of volatility eventually proved prescient (I made the same prediction for 2017!). Besides the equity markets (multiple posts with the latest one here), the non-company specific topics covered in this blog in 2018 ranged from the telecom sector (here), insurance (here, here, and here), climate change (here and here), to my own favourite posts on artificial intelligence (here, here and here). The most popular post (by far thanks to a repost by InsuranceLinked)) this year was on the Lloyds’ of London market (here) and I again undertake to try to post more on insurance specific topics in 2019. My company specific posts in 2018 centered on CenturyLink (CTL), Apple (AAPL), PaddyPowerBetfair (PPB.L), and Nvidia (NVDA). Given that I am now on the side-lines on all these names, except CTL, until their operating results justify my estimate of fair value and the market direction is clearer, I hope to widen the range of firms I will post on in 2019, time permitting. Although this blog is primarily a means of trying to clarify my own thoughts on various topics by means of a public diary of sorts, it is gratifying to see that I got the highest number of views and visitors in 2018. I am most grateful to you, dear reader, for that. 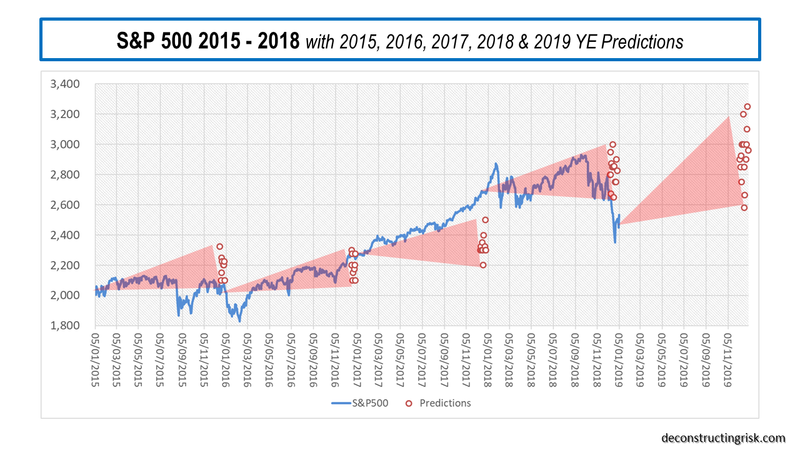 For 2019, the consensus EPS estimate is (currently) $171.00 with an average 2019 year-end target of 2,900 implying a 17 multiple. Given that this EPS estimate of 9% growth includes sectors such as energy with an assumed healthy 10% EPS growth projection despite the oil price drop, it’s probable that this EPS estimate will come down during the upcoming earnings season as firms err on the conservative side for their 2019 projections. The bears point to building pressures on top-line growth and on record profit margins. The golden boy of the moment, Michael Wilson of Morgan Stanley, calls the current 2019 EPS estimates “lofty”. The bulls point to the newly established (as of last Friday) Powell Put and the likely resolution of the US-China trade spat (because both sides need it). I am still dubious on a significant or timely relaxation of global quantitative tightening and don’t feel particularly inclined to bet money on the Orange One’s negotiating prowess with China. My guess is the Chinese will give enough for a fudge but not enough to satisfy Trump’s narcissistic need (and political need?) for a visible outright victory. The NAFTA negotiations and his stance on the Wall show outcomes bear little relation to the rhetoric of the man. These issues will be the story of 2019. Plus Brexit of course (or as I suspect the lack thereof). Until we get further insight from the Q4 earnings calls, my current base assumption of 4% EPS growth to $164 with a multiple of 15 to 16 implies the S&P500 will be range bound around current levels of 2,400 – 2,600. Hopefully with less big moves up or down! 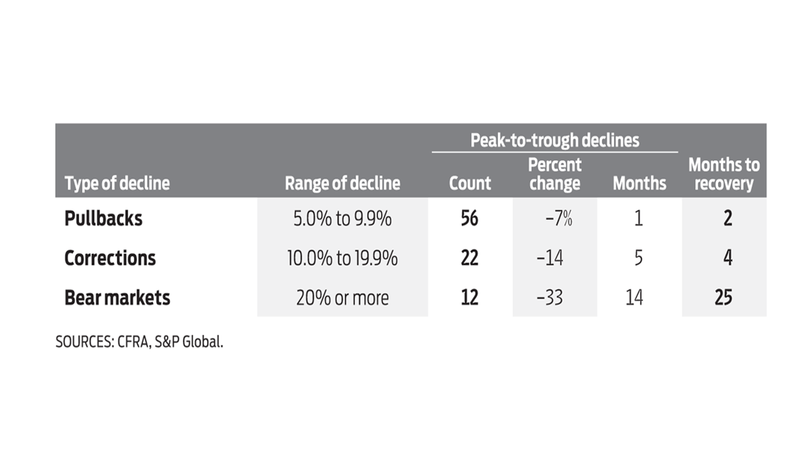 Historically, a non-recessionary bear market lasts on average 7 months according to Ed Clissold of Ned Davis Research (see their 2019 report here). According to Bank of America, since 1950 the S&P 500 has endured 11 retreats of 12% or more in prolonged bull markets with these corrections lasting 8 months on average. The exhibit below suggests that such corrections only take 5 months to recover peak to trough. To get a feel for the possible direction of the S&P500 over 2019, I looked at the historical path of the index over 300 trading days after a peak for 4 non-recessionary and 4 recessionary periods (remember recessions are usually declared after they have begun), as below. Note: These graphs have been subsequently updated for the S&P500 close to the 18th January 2019. I will leave it to you, dear reader, to decide which path represents the most likely one for 2019. It is interesting that the 1957 track most closely matches the moves to date (Ed: as per the date of the post, obviously not after that date!) but history rarely exactly rhymes. I have no idea whether 2019 will be naughty or nice for equity investors. I can predict with 100% certainty that it will not be dull…. Typically at this phase of the short-term debt cycle (which is where we are now), the prices of the hottest stocks and other equity-like assets that do well when growth is strong (e.g., private equity and real estate) decline and corporate credit spreads and credit risks start to rise. Typically, that happens in the areas that have had the biggest debt growth, especially if that happens in the largely unregulated shadow banking system (i.e., the non-bank lending system). In the last cycle, it was in the mortgage debt market. In this cycle, it has been in corporate and government debt markets. When the cracks start to appear, both those problems that one can anticipate and those that one can’t start to appear, so it is especially important to identify them quickly and stay one step ahead of them. So, it appears to me that we are in the late stages of both the short-term and long-term debt cycles. In other words, a) we are in the late-cycle phase of the short-term debt cycle when profit and earnings growth are still strong and the tightening of credit is causing asset prices to decline, and b) we are in the late-cycle phase of the long-term debt cycle when asset prices and economies are sensitive to tightenings and when central banks don’t have much power to ease credit. A very happy and healthy 2019 to all. 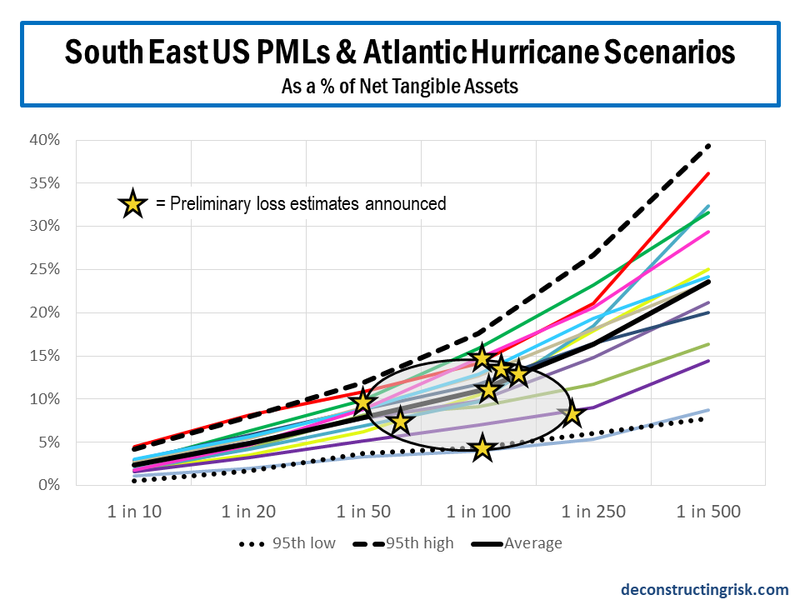 Following on from a recent post on windstorms in the US, I have taken several loss preliminary estimates recently published by firms (and these are very early estimates and therefore subject to change) and overlaid them against the South-East US probable maximum loss (PML) curves and Atlantic hurricane scenarios previously presented, as below. The range of insured losses for Harvey, Irma and Maria (now referred to as HIM) are from $70 billion to $115 billion, averaging around $90 billion. The loss estimates by firm depend heavily upon the risk profile of each. As a generalisation, it could be said that the aggregate US wind losses are averaging around the 1 in 100 loss level. 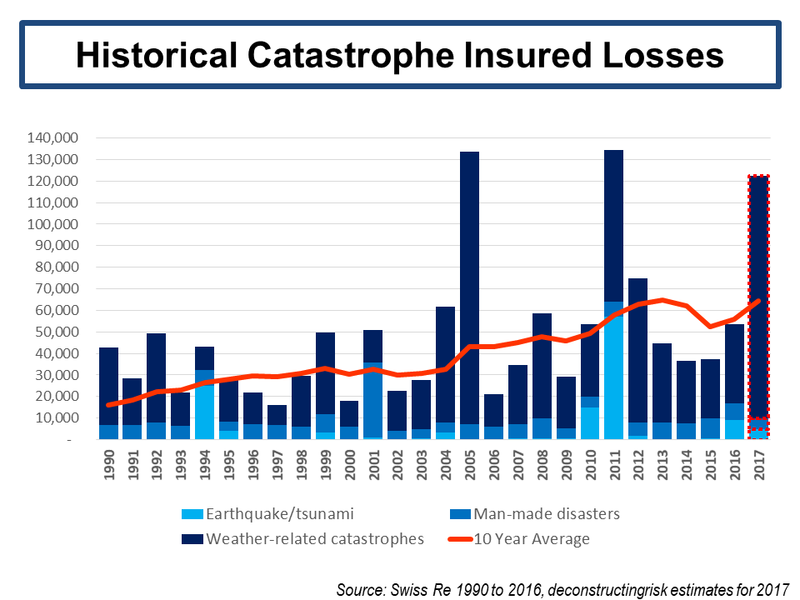 Given there was over $20 billion of insured losses from H1 and factoring in developing losses such as the Mexico earthquake, the California wildfires and the current windstorm Ophelia hitting Ireland, annual insured losses for 2017 could easily reach $120 billion. The graph below shows the 2016 estimates from Swiss Re and my $120 billion 2017 guesstimate (it goes without saying that much could still happen for the remainder of the year). At a $120 billion level of insured loss for 2017, the 10 year average increase from around $55 billion to $65 billion. In a post in early 2016, I estimated that catastrophe pricing was about 25% too low based upon annual average losses of $40 billion per year. We will see whether the 2017 losses are enough to deplete the overcapitalisation in the market and return pricing towards their technical rate. I wouldn’t hold my breath on that as although there may be material aggregate losses in the private collateralised market and other pockets of the retrocession market, the appetite of yield seeking investors will likely remain unabated in the current interest rate environment. Although the comparison between calendar year ratios and credit defaults is fraught with credibility issues (developed accident year ratios to developed default rates are arguably more comparable), I updated my previous underwriting cycle analysis (here in 2014 and here in 2013). Taking the calendar year net loss ratios of Munich Re and Lloyds of London excluding catastrophe and large losses (H1 results for 2017), I then applied a crude discount measure using historical risk-free rates plus 100 basis points to reflect the time value of money, and called the resulting metric the adjusted loss ratio (adjusted LR). 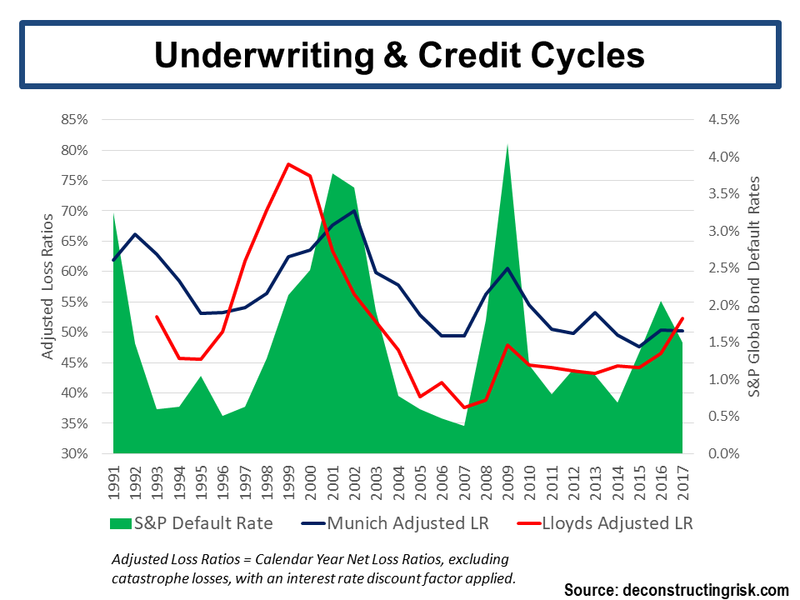 I compared these adjusted LRs for Munich and Lloyds to S&P global bond credit default rates (by year of origin), as per the graph below. This shows that the years of relatively benign attritional claims together with the compounding impact of soft pricing over the past years may finally be coming to an end. Time will tell. All in all, it makes for a very interesting period for the market over the next 6 to 12 months. In the interim, let’s hope for minimal human damage from the current California wildfires and windstorm Ophelia. It has been a while since I posted on dear old Solvency II (here). As highlighted in the previous post on potential losses, the insurance sector is perceived as having robust capital levels that mitigates against the current pricing and investment return headwinds. It is therefore interesting to look at some of detail emerging from the new Solvency II framework in Europe, including the mandatory disclosures in the new Solvency and Financial Condition Report (SFCR). The June 2017 Financial Stability report from EIOPA, the European insurance regulatory, contains some interesting aggregate data from across the European insurance sector. 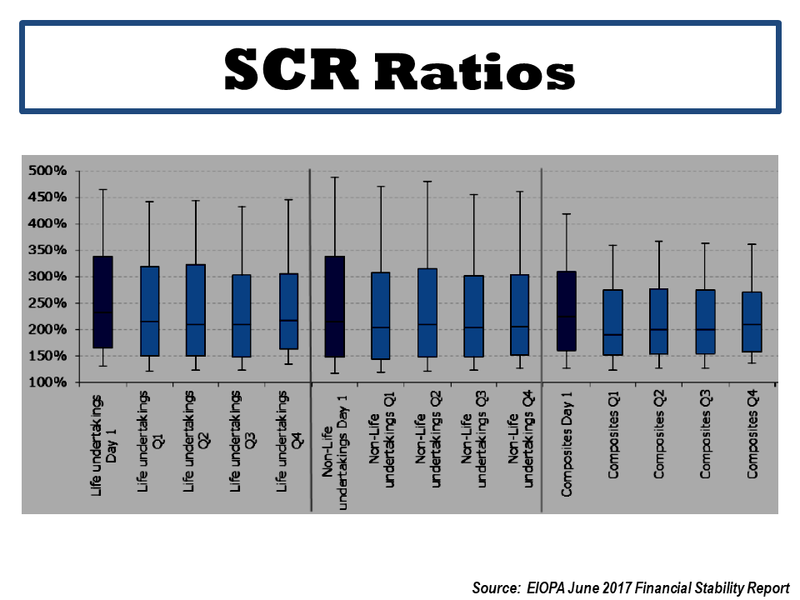 The graph below shows solvency capital requirement (SCR) ratios, primarily driven by the standard formula, averaging consistently around 200% for non-life, life and composite insurers. The ratio is the regulatory capital requirement, as calculated by a mandated standard formula or a firm’s own internal model, divided by assets excess liabilities (as per Solvency II valuation rules). 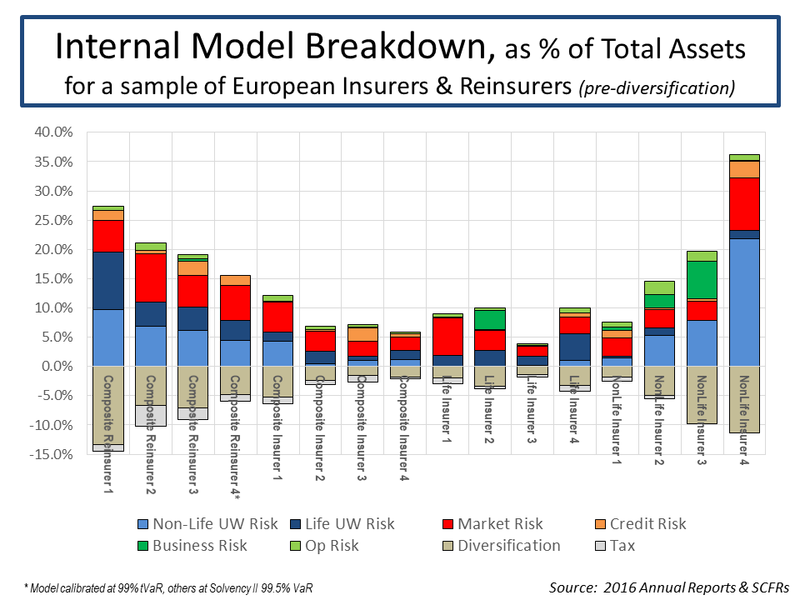 As the risk profile of each business model would suggest, the variability around the average SCR ratio is largest for the non-life insurers, followed by life insurers, with the least volatile being the composite insurers. 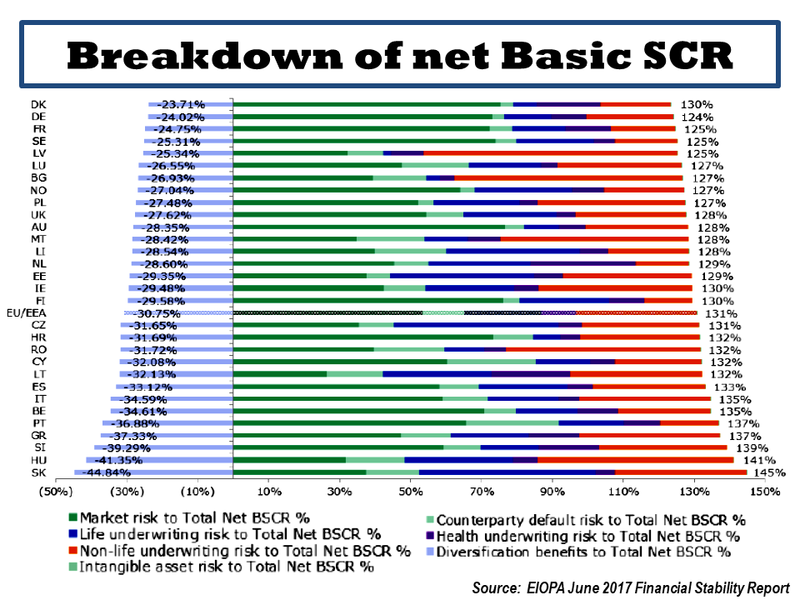 For some reason, which I can’t completely comprehend, the EIOPA Financial Stability report highlights differences in the SCR breakdown (as per the standard formula, expressed as a % of net basic SCR) across countries, as per the graph below, assumingly due to the different profiles of each country’s insurance sector. 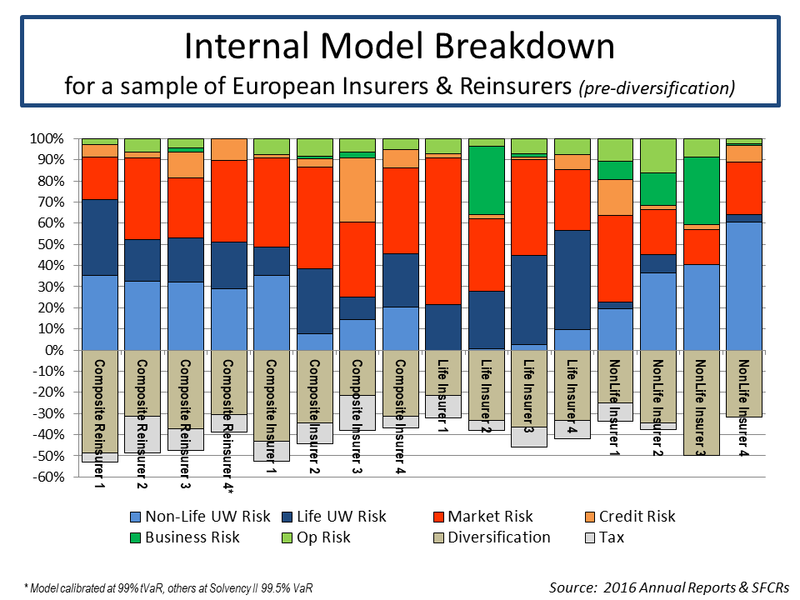 A review across several SFCRs from the larger European insurers and reinsurers who use internal models to calculate their SCRs highlights the differences in their risk profiles. A health warning on any such comparison should be stressed given the different risk categories and modelling methodologies used by each firm (the varying treatment of asset credit risk or business/operational risk are good examples of the differing approaches). The graph below shows each main risk category as a percentage of the undiversified total SCR. By way of putting the internal model components in context, the graph below shows the SCR breakdown as a percentage of total assets (which obviously reflects insurance liabilities and the associated capital held against same). This comparison is also fraught with difficulty as an (re)insurers’ total assets is not necessarily a reliable measure of extreme insurance exposure in the same way as risk weighted assets is for banks (used as the denominator in bank capital ratios). For example, some life insurers can have low insurance related liabilities and associated assets (e.g. for mortality related business) compared to other insurance products (e.g. most non-life exposures). Notwithstanding that caveat, the graph below shows a marked difference between firms depending upon whether they are a reinsurer or insurer, or whether they are a life, non-life or composite insurer (other items such as retail versus commercial business, local or cross-border, specialty versus homogeneous are also factors). Initial reactions by commentators on the insurance sector to the disclosures by European insurers through SFCRs have been mixed. Some have expressed disappointment at the level and consistency of detail being disclosed. Regulators will have their hands full in ensuring that sufficiently robust standards relating to such disclosures are met. Regulators will also have to ensure a fair and consistent approach across all European jurisdictions is adopted in calculating SCRs, particularly for those calculated using internal models, whilst avoiding the pitfall of forcing everybody to use the same assumptions and methodology. Recent reports suggest that EIOPA is looking for a greater role in approving all internal models across Europe. Systemic model risk under the proposed Basel II banking regulatory rules published in 2004 is arguably one of the contributors to the financial crisis. Only time will tell if Solvency II has avoided the mistakes of Basel II in the handling of such beautiful models. With four US hurricanes and one earthquake in current times, mother nature is reminding us homo-sapiens of her power and her unpredictability. As the massive Hurricane Irma is about to hit Florida, we all hope that the loss of life and damage to people’s lives will be minimal and that the coming days will prove humane. Forgive me if it comes across as insensitive to be posting now on the likely impact of such events on the insurance industry. For the insurance sector, these events, and particularly Hurricane Irma which is now forecast to move up the west coast of Florida at strength (rather the more destruction path of up the middle of Florida given the maximum forces at the top right-hand side of a hurricane like this one), may be a test on the predictive powers of its models which are so critical to pricing, particularly in the insurance linked securities (ILS) market. Many commentators, including me (here, here and here are recent examples), have expressed worries in recent years about current market conditions in the specialty insurance, reinsurance and ILS sectors. On Wednesday, Willis Re reported that they estimate their subset of firms analysed are only earning a 3.7% ROE if losses are normalised and reserve releases dried up. David Rule of the Prudential Regulatory Authority in the UK recently stated that London market insurers “appear to be incorporating a more benign view of future losses into their technical pricing”, terms and conditions continued to loosen, reliance on untested new coverages such as cyber insurance is increasing and that insurers “may be too sanguine about catastrophe risks, such as significant weather events”. With the reinsurance and specialty insurance sectors struggling to meet their cost of capital and pricing terms and conditions being so weak for so long (see this post on the impact of soft pricing on risk profiles), if Hurricane Irma impacts Florida as predicted (i.e. on Saturday) it has the potential to be a capital event for the catastrophe insurance sector rather than just an earnings event. On Friday, Lex in the FT reported that the South-East US makes up 60% of the exposures of the catastrophe insurance market. The models utilised in the sector are more variable in their output as events get bigger in their impact (e.g. the higher the return period). 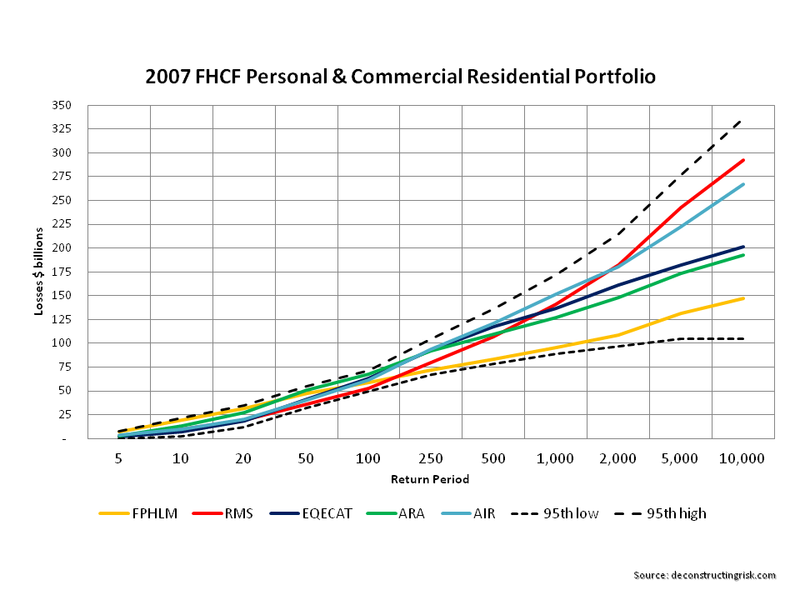 A 2013 post on the variation in loss estimates from a selected portfolio of standard insurance coverage by the Florida Commission on Hurricane Loss Projection Methodology (FCHLPM) illustrates the point and one of the graphs from that post is reproduced below. Based upon the most recent South-East US probable maximum losses (PML) and Atlantic hurricane scenarios from a group of 12 specialty insurers and reinsurers I selected, the graph below shows the net losses by return periods as a percentage of each firm’s net tangible assets. This graph does not consider the impact of hybrid or subordinate debt that may absorb losses before the firm’s capital. I have extrapolated many of these curves based upon industry data on US South-East exceedance curves and judgement on firm’s exposures (and for that reason I anonymised the firms). The results of my analysis confirm that specialty insurers and reinsurers, in aggregate, have reduced their South-East US exposures in recent years when I compare average figures to S&P 2014 data (by about 15% for the 1 in 100 return period). Expressed as a net loss ratio, the average for a 1 in 100 and a 1 in 250 return period respectively is 15% and 22%. These figures do look low for events with characteristics of these return periods (the average net loss ratio of the 12 firms from catastrophic events in 2005 and 2011 was 22% and 25% respectively) so it will be fascinating to see what the actual figures are, depending upon how Hurricane Irma pans out. Many firms are utilising their experience and risk management prowess to transfer risks through collaterised reinsurance and retrocession (i.e. reinsurance of reinsurers) to naïve capital market ILS investors. If the models are correct and maximum losses are around the 1 in 100 return period estimates for Hurricane Irma, well capitalized and managed catastrophe exposed insurers should trade through recent and current events. We will see if the models pass this test. For example, demand surge (whereby labour and building costs increase following a catastrophic event due to overwhelming demand and fixed supply) is a common feature of widespread windstorm damage and is a feature in models (it is one of those inputs that underwriters can play with in soft markets!). Well here’s a thought – could Trump’s immigration policy be a factor in the level of demand surge in Florida and Texas? The ILS sector is another matter however in my view due to the rapid growth of the private and unregulated collateralised reinsurance and retrocession markets to satisfy the demand for product supply from ILS funds and yield seeking investors. The prevalence of aggregate covers and increased expected loss attachments in the private ILS market resembles features of previous soft and overheated retrocession markets (generally before a crash) in bygone years. I have expressed my concerns on this market many times (more recently here). Hurricane Irma has the potential to really test underwriting standards across the ILS sector. 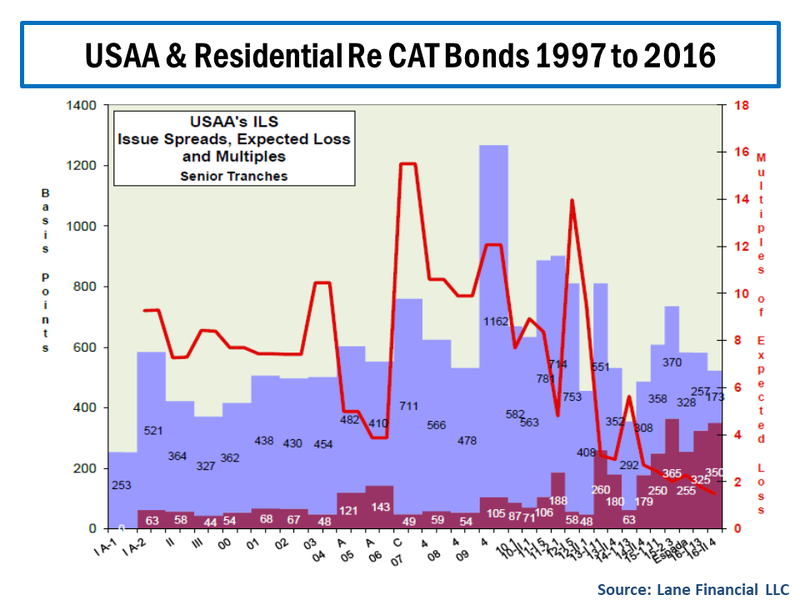 The graph below from Lane Financial LLC on the historical pricing of US military insurer USAA’s senior catastrophe bonds again illustrates how the market has taken on more risk for less risk adjusted premium (exposures include retired military personnel living in Florida). The events in the coming days may tell us, to paraphrase Mr Buffet, who has been swimming naked or as Lex put it on Friday, “this weekend may be a moment when the search for uncorrelated returns bumps hard into acts of God”. Hopefully, all parts of the catastrophe insurance sector will prove their worth by speedily indemnifying peoples’ material losses (nothing can indemnify the loss of life). After all, that’s its function and economic utility to society. Longer term, recent events may also lead to more debate and real action been taken to ensure that the insurance sector, in all its guises, can have an increased economic function and relevance in an increasingly uncertain world, in insuring perils such as floods for example (and avoiding the ridiculous political interference in risk transfer markets that has made the financial impact of flooding from Hurricane Harvey in Texas so severe). Notwithstanding the insurance sector, our thoughts must be with the people who will suffer from nature’s recent wrath and our prayers are with all of those negatively affected now and in the future.